View of Glandalough in the Wicklow Mountains, Ireland. Glendalough translates as 'valley of the two lakes', and this area is one of the most important religious sites in Ireland. A monastic settlement was founded here by St. Kevin in the 6th century, the settlement flourished as a centre for pilgrims and scholars and in the 12th century Glendalough was an important town with seven churches. After this period the dioceses of Glendalough and Dublin unified and the importance of the site declined. The remains of a 100ft Round Tower, St. Kevin’s Church, a Cathedral and several high crosses still stand today. 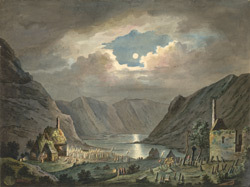 Pilgramages and fairs were still held in Glendalough until the 19th century and a Catholics celebration can be seen in the foreground of this print.